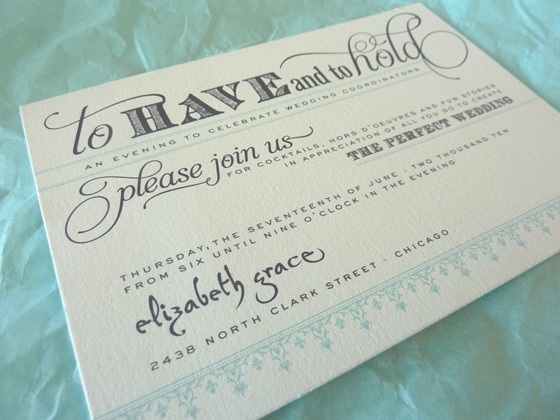 Elizabeth Grace – Chicago Wedding Paperie — Sweetchic Events, Inc.
Last night I had the pleasure of attending a party in honor of Chicago wedding planners hosted by Laura of Elizabeth Grace, a charming paperie and gift boutique in Lincoln Park. I wish I had the notion to take some pictures of the lovely soiree, but immediately upon entering, I was handed a glass of my very favorite wine – Moscato d’Asti – and my other hand was busy munching on some yummy canapés. Sorry, priorites ya know :P The gorgeous invitation, so thick you could eat off it! I adore the use of different fonts! I left with a pretty canvas swag bag, and when I rummaged through it later, I was excited to discover some true goodies! (Lots of times when you get a so-called “swag” bag, it’s not unusual for it to be filled with flyers, pens, magnets and random tchotchkes). 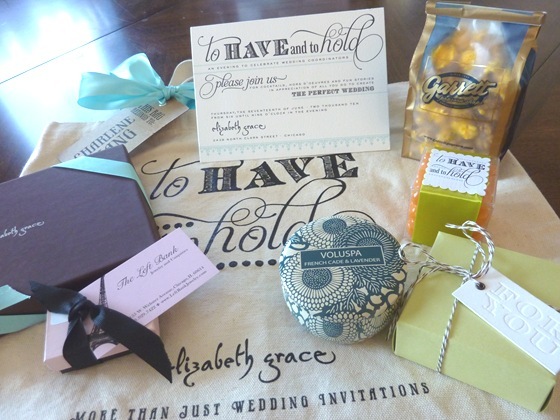 Notice how the artwork on the bag perfectly coordinates with the invitations! And then the yummy Garrett popcorn, cute jelly beans, Voluspa candle… and what are in those boxes? 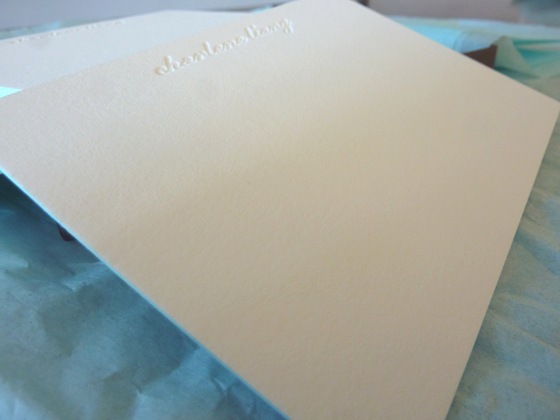 And the crown jewel… a set of personalized notecards with my name letterpressed into the super-luxe Crane’s paper (can you even call it paper? It’s seriously as thick as carboard). If you haven’t checked out the fabulous Elizabeth Grace boutique (2438 N. Clark Street, Chicago), then I highly recommend you do! 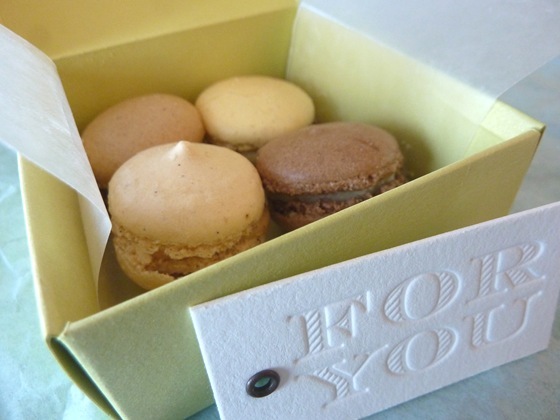 They carry amazing invitations, tons of sweet gifts as well as non-wedding related items!